Got $900 burning a hole in your pocket? I'm sure you do, right? Well then, friend, you are in luck! 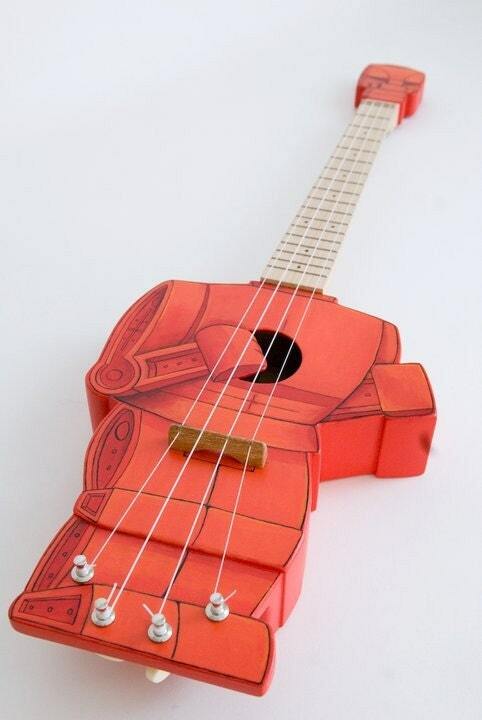 Check out this rad Rock 'em Sock 'em Robot Tenor Ukulele (aka the Robolele). Celentanowoodworks, from Ashville N.C., will build you one of these babies to order. Looks like the ukulele is mostly maple and can be made to different sizes, if you so desire. Can I get a "hell yeah" up in this piece? If you think this is rad, take a look at the other cool instruments the etsy shop. The broken and rusty gears in my brain are definitely spinning now. You see, I have a good friend who also lives in Ashville (at least, I think that's where he lives). Maybe I can talk him into heading over to Celentanowoodoworks' house and southern-charming them down on the price. It's worth a shot, right? While we are talking about my friend, you should probably check out his rad Etsy shop for his ceramics and pottery and stuff. His store is called Mudstuffing.